Recruiting Office By request, a forum for Traveller Referees seeking players in their area and vice-versa. Beginning Wednesday April 23rd, played weekly at GoodGames Melbourne CBD. 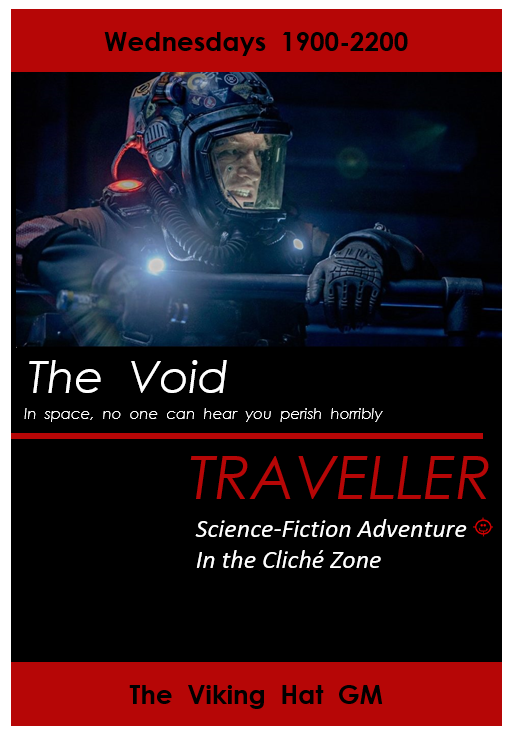 Out on the frontier, people live hard lives, carrying the scars of near death from vacc bite, poisonous atmosphere, radiation, heavy metals, too long in high gravity or low. There are no reactionless drives, no artificial gravity, no man portable lasers, no artificial intelligence - not since the AI Wars of centuries ago. There are only fusion drives if you're lucky and fission drives if you're not, and Jump drives. There are no aliens but Man. Outside a thin shell of metal is the Void. "The Void breaks everyone," Ensign Ernest said, "and afterward many are strong at the broken places. But those that will not break it kills. It kills the very good and the very gentle and the very brave impartially. If you are none of these you can be sure it will kill you too but there will be no special hurry. Here's your contract, I've marked where you sign."